Email us an account of your trip from Windhoek to Victoria Falls and we'll email you a travel voucher back. Air Namibia offers flights from Windhoek (WDH) to Victoria Falls (VFA) which have a technical stop in Maun (Botswana). Use the flight price comparison tool on the left to compare prices with other airlines flying 1-stop. As the crow flies, it is 999km from Windhoek to Victoria Falls. An overland trip from Windhoek to Victoria Falls is 1445km along the B1 and B8, taking some 19 hours. Along the way you pass Okahandja (have a look out for the Von Bach Dam & vacation resort, which provides Windhoek with most of its water), the Omatako Mountains (2340m), Otjiwarongo (translated means place where fat cattle graze), Otavi (where the German Army was defeated by South African troops on the 1st July 1915), Kombat (the place of the giraffe), Grootfontein (settled in 1885 by 40 Boer families, but abandoned in 1887 when the area fell under Portuguese control), Rundu (on the Angolan border), Divundu (on the Okavongo River), Andara, Bagani (home to the Mbukushu kings), Impalila (which has an airport which was a military base used in the 1980s by the South African Defence Force) and Kazungula (lies at a quadripoint where 4 countries nearly meet). The Intercape bus offers trips from Windhoek to Victoria Falls. "The flight from Windhoek to Victoria Falls was delayed due to technical reason. This time the aircraft was much smaller, as it suits the brief 1hr 20 min long journey. 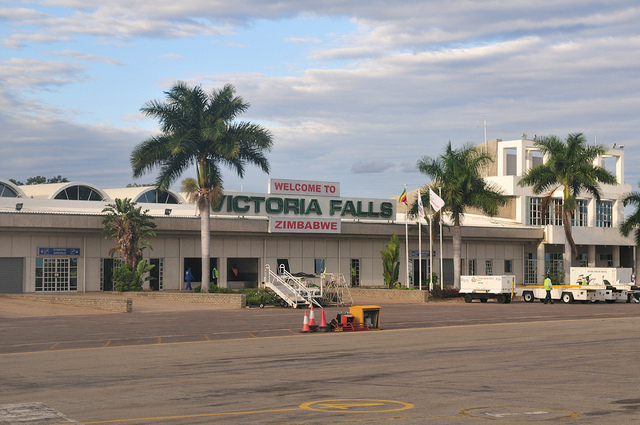 There couldn’t have been more than 15 passengers on the plane, most of which got off at Victoria’s Falls. Much to my surprise, a full size lunch was served, followed by a decent sandwich on the next 30 min flight. I guess the ‘pretzel bag’ tendency has not yet overtaken Air Namibia’s food policy. And again, awesome tomato juice." The Stanley & Livingstone, which is (not in the hustle & bustle of Victoria Falls, & you can watch game in the watering hole by the pool. Room with higher numbers have superior views of the park. The Elephant Camp. Luxury tents facing the bushveld, with plunge pools. Be sure to check how far your room is from reception.